Time is racing on and Operation Pram Push is still in full swing and the almighty Walking Wagons from Holland have arrived. 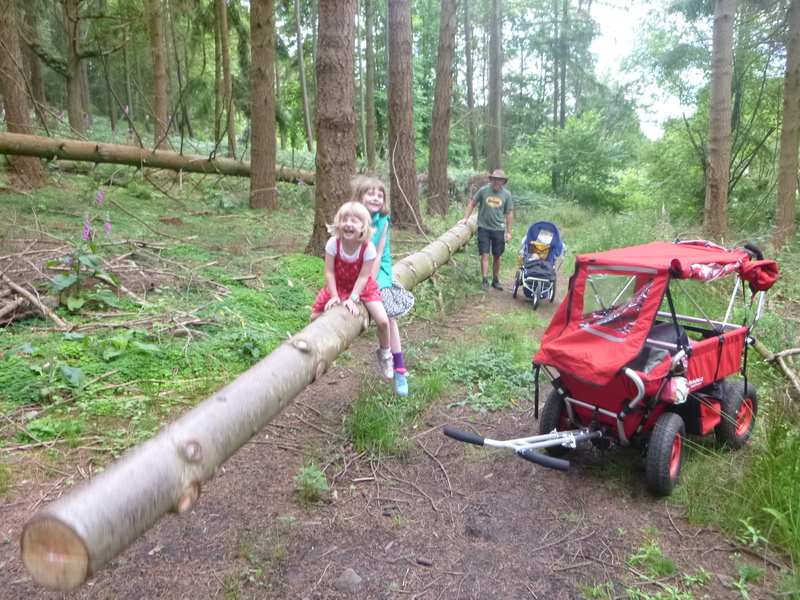 Last weekend I took one of these wagons for a test pull-and-push with Molly and Daisy and Jack. And there they are, the distant South Downs ahoy! 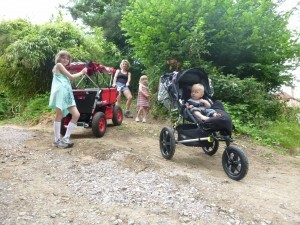 In 3 weeks time we will be up there with Anoek and Mila and the juggling Goose (see previous postings for explanations) camping and walking with these fantastic monster wagons and pram in an attempt to travel the entire 100-mile length of the South Downs Way from Winchester to Eastbourne. ...before heading for a bit of rough and tumble. Molly acted as the guard, standing on the footplate on the rear, taking tickets and asking all passengers to 'move right along the bus now please'. ...which, aided by Gary, bounced up and down about 5-foot in the air. 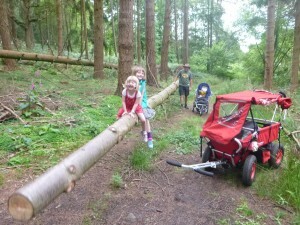 You don't get fun like this in a health-and-safety padded playground. 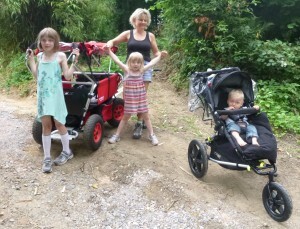 I will be raising money on Operation Pram Push for the charity Dreams Come True which helps children with terminal and serious illnesses. I hope to raise enough money to give the charity a Nihola Trike (like the one I use on the school run) so that some of the children can experience the fun and freedom of cycling. Testing testing. 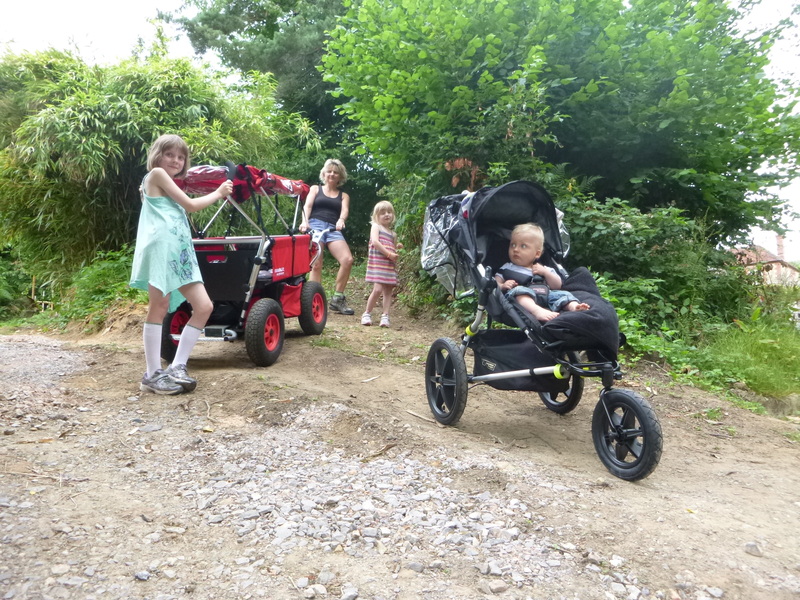 The new Mountain Buggy pushchair arrives! 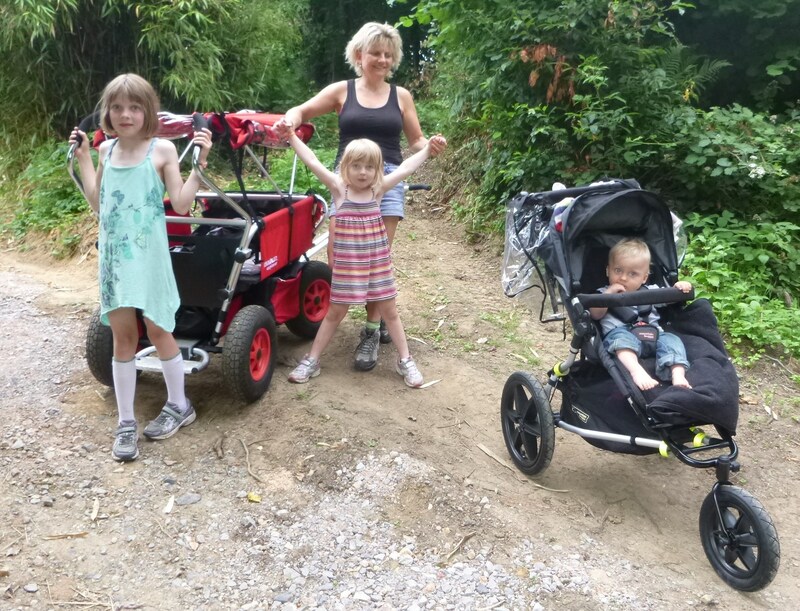 The best pushchair I could find that should be up for the ups and downs rigours of Operation Pram push is the Mountain Buggy Terrain which comes with extra sturdiness and extra bounce. So a big thank you to Mountain Buggy for providing me with one for the pram-pushing voyage that begins next week. 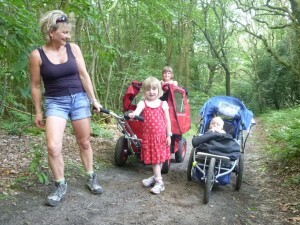 And ditto to the Dutch Walking Wagon brigade for the two Walking Wagon Rambler Explorers. 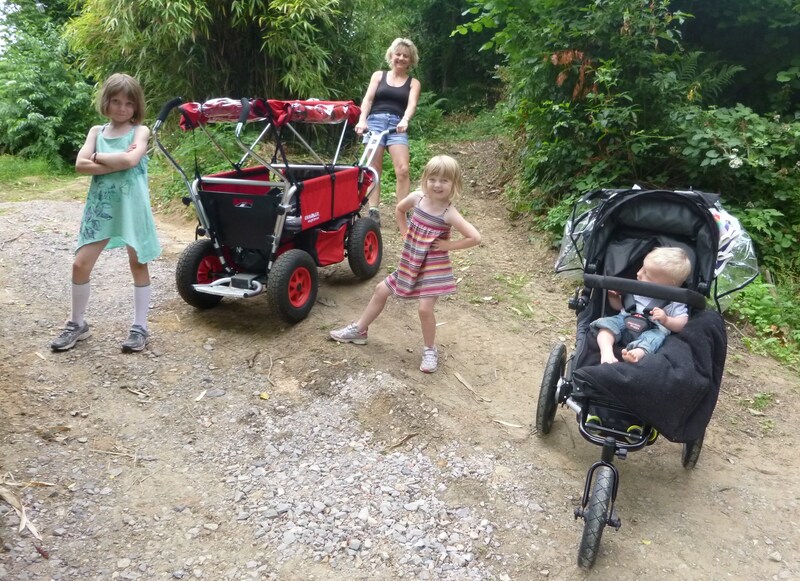 So here I am with the girls and young Jack posing with our new assortment of wheeled wagons. More posing...and even a bit of pulling! It's beginning to dawn on me that I could be biting off more than I can chew. 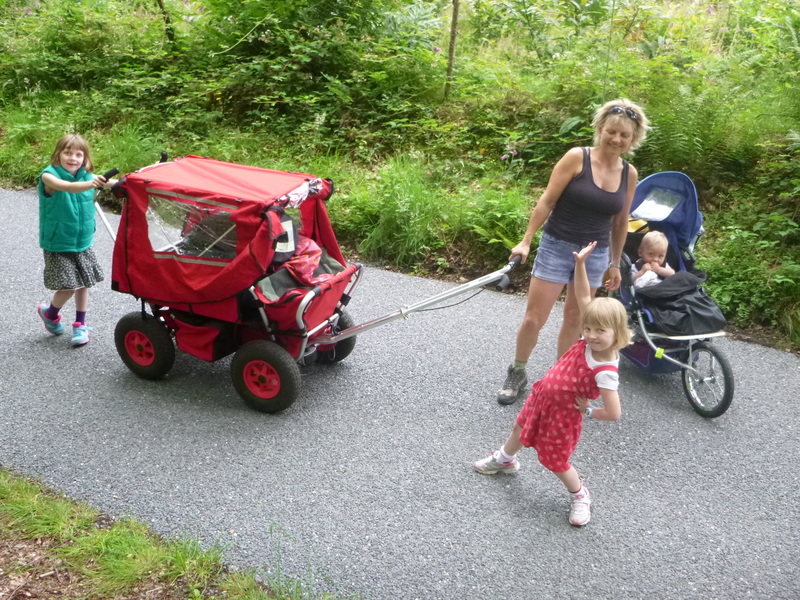 This Walking red Wagon is currently unloaded but even attempting to pull it a few feet up this slight hill and I was thinking this Operation Pram Push lark could be hard work! 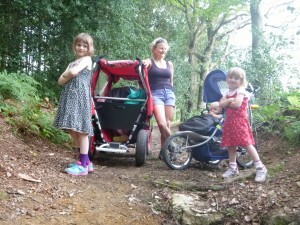 So this is the pram-pushing plan so far: Start in Winchester August 1st and push to Eastbourne. Camping all the way. 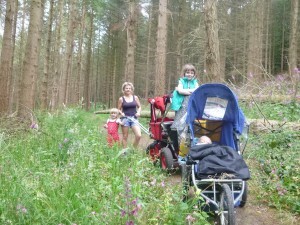 The builder husband to meet us at intervals bearing emergency supplies of food, water and nappies. The whole jolly escapade will take about a month. The conventional route appears to start the South Downs Way at Eastbourne and end at Winchester. East to West. It makes more sense to me to do West to East for the following reasons: 1. The start is quite close to home so should disaster strike or the more pocket-sized members of the team be suffering from lack of fatherly tenderly moments, he can leap into his van and be with us in a jiffy. Or so we hope. 2. 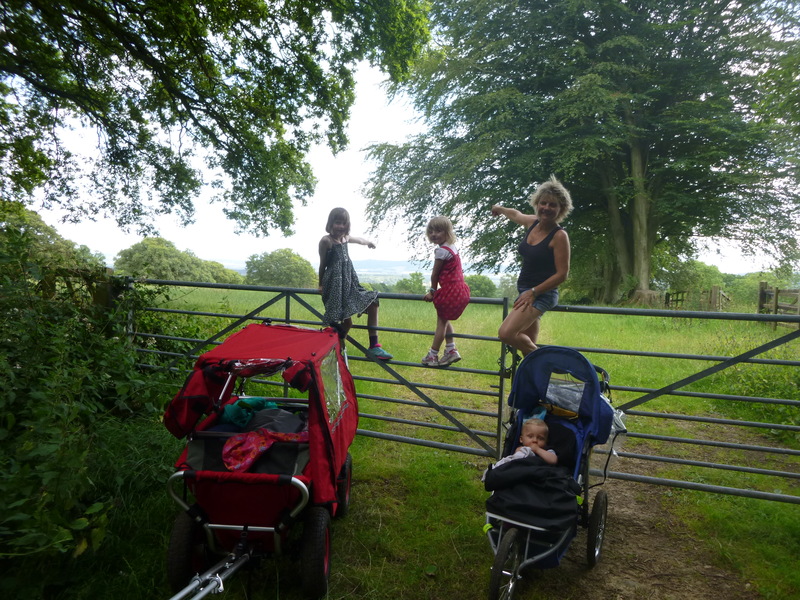 Not walking all day with the sun in our eyes, or should the sun not be shining, not walking all day with the prevailing wind and driving rain in our faces - not that it's allowed to be anything but perfect weather, thank you very much. 3. East to West is a better incentive for the junior members of the party to head from town to sea - thus with every footstep getting ever-closer to fairground rides and ice creams on the beach. Hi Josie, It sounds a silly question,but can you tell me the whereabouts of the start of the South Downs way in Winchester ? In guide books they seem to start in Eastbourne (which seems crazy…much better to start in town and finish at the coast) it’s never clear where you begin if you want to do it the other way! Good luck,by the way! Not long now! Hi Clare, I’m going to start in the heart of the city at Winchester Cathedral. So yes, I’m going west to east. Like you I think it makes more sense to start in town and head for the sea – and it’s good incentive for the girls too: every footstep takes them closer to the seaside and ice creams on the beach! Good thinking! If you climb down the new set of steps to the beach at Birling Gap , there’s a lovely cove for swimming too.I have done a lot of the Eastbourne end of the South Downs Way,as it is close to me,but I feel the urge to walk the rest of it now .A good look around the heart of Winchester , and the Cathedral ,would be interesting too as I have not visited before.Happy trails! But it’s part of the fun. Kids can even help and thus enjoy playing a part in it with moving gear accross the fence. 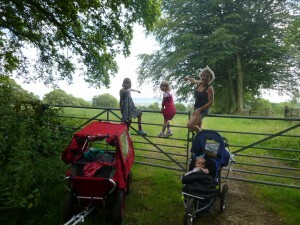 1st check if fence/gate can be opened or surpassed at more convenient point just next to the place you have to cross. For examle if there is only 1 high placed wire next to the gate than you can push/pull the car under it, just remove pushbars and it will fit. 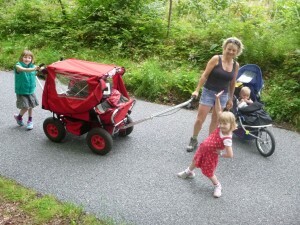 remove heavy and loose gear from the car (kids can help and they will like it) and put it on the otherside of fence/gate. 4rd if gate is too high you need to lift front end first on the gate. 5th if gate/fence is too fragile. Disassemble the car and over the fence with the parts. Its lovely here in Eastbourne! In fact we spent the day at Birling Gap and then into the town. Yes, all well thanks. Off next week. Lots to do before then though! 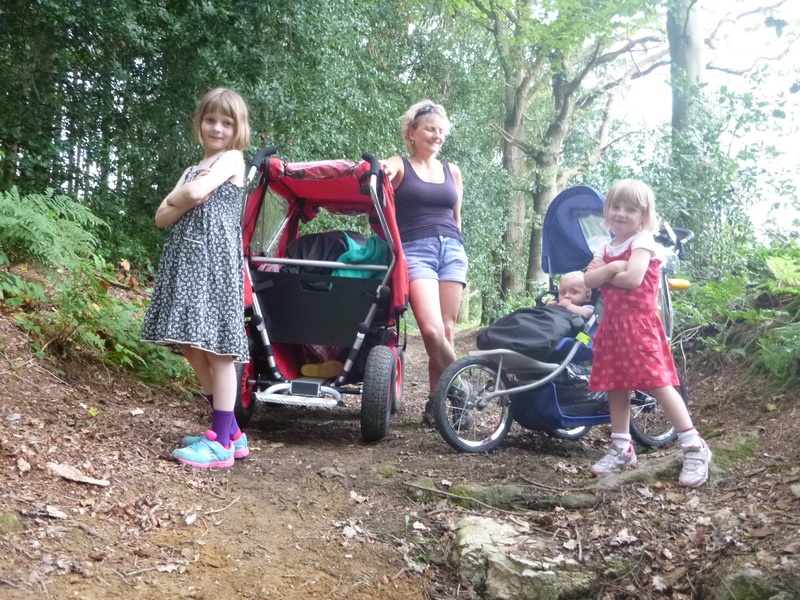 Hope this weather holds – or a bit cooler and duller would be nice, but no rain please. I don’t want a monsoon August. Thanks for your pulling offers. Will keep you posted on progress. many good wishes to you all:let’s hope the weather in August is as good or better than it was for the Tour in Yorkshire…I thought to myself while watching it, gosh ,so that’s what we missed in September!(2013). It was composed mostly of FOG. I’m sorry you will arrive at Eastbourne too late to see the pier in all its glory. ……………& BON VOYAGE! 0f course. Certain phenomena tend to provoke bad weather. 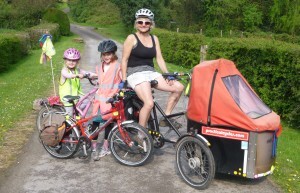 These include bank holidays and expeditions by a certain cyclist and travel author. It’s hapening now. Wow, that’s quite a cavalcade Josie. I’ve not been looking at blogs for a while as I never get anything done. I must say you and your team look like the Famous Five on one of their Adventures. By now you will have done this. I hope it went well. Bit late! It’s now 2017 :-o. It’s taken me this long to get through all those lovely photos (I don’t think). Josie, you certainly know the best way to bring up a family. And that’s in England. I must check out the rest of the stories and pictures some time. Wow.